Red Valve’s all new Type R all-elastomer pinch valve is an ideal valve for water, chemical, solids, and slurry applications. The valve is easily installed between two pieces of pipe with hose clamps. Simply add 20 psi air pressure over line pressure and the valve closes drop tight. For example: Process line pressure is 45 psi; 20 psi over line pressure, or 65 psi, closes the valve. It’s that simple! The Type R has all the advantages of a Pinch Valve: no packing gland or seat crevices; this full port valve eliminates bridging or slurry dewatering blockage associated with metal seated valves. Each time the valve flexes it self-cleans. The Type R Pinch Valve is ideal for use with pulse type control systems. The lightweight design of the Type R Pinch Valve makes pipe supports unnecessary. The type R is an excellent valve to have in stock for an instant valve repair or to isolate a pipeline. 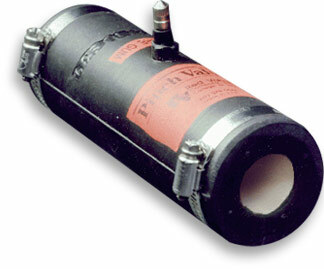 The valve body is elastomer reinforced with fabric, bonded to the inner sleeve – the only wetted part. Air connection is a 5/16” valve stem. The unique one-piece design of the Type R Pinch Valve eliminates the need for actuators, making this the most affordable, maintenance-free automatic valve available to industry!